Printed on a 32pt thick, 5"x7" sandwich postcard with a yellow seam. It's lovely as a postcard to write to your favorite person, or framed and nestled in your personal Eden. Prepare your soon to be ex-lover by sliding this postcard under their door. This 5"x7" sandwich postcard has a pink seam and a writeable back where you can express that "It's not You, it's Me". 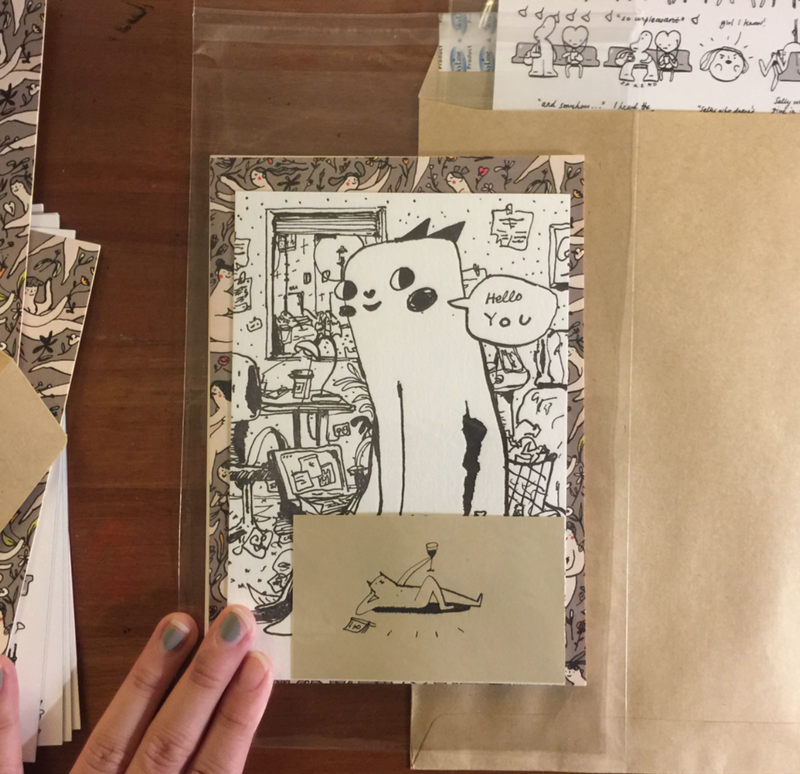 Two-sided "postcard" comic! Give this to your neighborhood trainspreader to tell them how much they are the worst. Or don't. Because they're the worst, and this is a really nice, thick, 5"x7" sandwich postcard with a black seam. Because it's so irritatingly creative and can't be written on, it can be framed in a double-sided frame and set on your table. Letterpressed Box Set, containing the first edition of the Dogswurld comics and a small print of the Fifty Dogs poster. Edition of 50, and honestly they're a real labor of love to hand-fold so grrl if u want it u gotta love it. MoCCA's Silver Medal for Special Format, 2017. A lush, letterpressed postcard of our Dogswurld protagonist, Biddy. You caught him in the middle of writing. This 4.5"x6.5" postcard is from a limited print run, and the back is blank with a signature from yours truly. A crowded subway station in the dog-eat-dog metropolitan city. Illustrated to Simon & Garfunkel's Sound of Silence. The hand-printed poster emerges from a tube in a 16.5in x 25in size, printed on Arches Text Wove paper. To purchase something, fill up the form on the right and I'll be in touch with you via your email. Note: The cards will not come with frames. All frames were bought from Ikea, except for the transparent double-sided frame, which you can get from an office stationery store! If purchasing more than one of a particular item, make a note of it in the box below! Please also note shipping costs and deal if purchasing four postcards. Thank you! I'll be in touch soon with an email.